2 for 1 Cocktails at Flaming Grill Pubs Valid from 5 pm daily! The £6 Round at Flaming Grill Pubs Valid all day every day! Lunch Club - Sandwich or Baked Potato, Side & Drink for £6.79 at Flaming Grill Pubs Valid Monday to Saturday until 4 pm! Drink for £1 with Sunday Roast Bookings at Flaming Grill Pubs Valid all day Sunday! Drink for £1 with Any Burger Order at Flaming Grill Pubs Valid all day, each and every day! Drink for £1 with Any Steak Order at Flaming Grill Pubs Only valid from Monday to Friday! Coffee & Cake from £2.99 at Flaming Grill Pubs Have your cake and coffee and enjoy at Flaming Grill Pubs! Double Up on Spirits for £1.50 at Flaming Grill Pubs Are you seeing double yet? Pop to Flaming Grills where you can double up for £1.50! Parent company Greene King say that their Flaming Grill pubs are ‘simply made for fun, all round food’. From the outset, Flaming Grill has always aimed to provide a traditional and family-friendly pub environment where punters can enjoy their signature ‘flaming great steaks’ and enjoying great pub sport, quizzes, and of course special offers and deals. 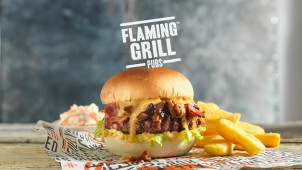 Across the UK, Flaming Grill has 140 different pubs, serving everything from beers on draught to cocktails and prosecco. Flaming Grill knows that everybody loves a great deal, so along with your Flaming Grill Pubs offer, you can also take advantage of some of the daily deals that they have available such as Steak Nights on Saturdays or £1 for a drink with your burger Wednesdays. When it comes to sport, you can rely on Flaming Grill to create a good atmosphere. If you enjoy going down to the pub to watch your football team play, then look no further than Flaming Grill, who show all the big games live at your local. Be sure to book a table, though, as the pubs fill up quickly on match day! How do I use my Flaming Grill vouchers? Print your voucher, write it down, or save it on your smartphone. Go to the Flaming Grill Pubs site and choose the pub that you’d like to eat at. Then, you can book a table. Once you arrive at the Flaming Grill pub, you should let the bar staff know that you will be using a voucher before you order. This will make it easier for them to apply the discount. When paying, present the cashier with your voucher and enjoy your savings! If you enjoy a burger and a beer when you visit the pub, be sure to get down to your local Flaming Grill on a Wednesday, where you can add a drink to your burger meal for just £1 extra. Choose from any burger on the menu (except the challenge burgers) and choose from a range of beers, ciders or soft drinks to accompany your meal. When do Flaming Grill Pubs open? Most Flaming Grill pubs are open from around 11 am -11 pm. If you would like to find out the opening times of a specific pub, you can use the pub locator tool on the Flaming Grill website. Although you can book a table on the Flaming Grill Pubs website, it’s not required and visitors can also turn up on the door. However, it’s advised that you book a table if it’s expected to be busy, such as on match day or quiz night. Do Flaming Grill pubs cater for Special Dietary requirements? Flaming Grill pubs offer vegetarian options, however, they will do their best to cater to any other special dietary requirements on request. If you have a specific query about the food that you are going to order, you can find your local Flaming Grill pub using the pub finder tool on the website and get in touch with them directly. You can use the contact form here to get in touch with Flaming Grill Pubs. Find your local pub for correct opening hours. Price? Main courses are £5-£20, but along with extra money off mains with Flaming Grill Pubs vouchers, you can typically enjoy even more for your money! FLAME-GRILLED RUMP STEAK SERVED ON SIZZLING ONIONS WITH MUSHROOMS, HALF A GRILLED TOMATO, PEAS, ONION RINGS AND A GIANT DOUBLE PORTION OF CHIPS. FLAME-GRILLED 6OZ BEEF BURGER TOPPED WITH SPICY CHILLI BEEF, NACHOS, CHEDDAR CHEESE SLICE AND SOUR CREAM. SERVED IN A BRIOCHE BUN WITH SLICED TOMATO, MIXED SALAD LEAVES AND CHIPS. CHOCOLATE AND VANILLA FLAVOURED ICE CREAM TOPPED WITH MALTESERS, MARS BAR CHUNKS, HONEYCOMB PIECES, CREAM AND CHOCOLATE FLAVOUR SAUCE WITH CRISPY WAFERS. Arriving at Flaming Grill we were instantly struck by its cosy and welcoming atmosphere and with a prompt welcome from a friendly waiter we were shown to our table, given menus and told to order at the bar once we were ready. The menu was full of great choices from pub classics to BBQ feasts and Mexican grill. This was my first time eating at the Flaming Grill so after hearing about the brand new menu it was too tempting to pass up! Being quite possibly the biggest fan of BBQ/Grill meat (it’s high in iron and vitamin B12 don’t you know?) it seemed only right I rise to the ‘Defeat the meat’ challenge and show them who’s boss. I ordered the 24oz steak, cooked to medium and served on a sizzling plate with all the yummy trimmings you could ask for on a hungry stomach. Besides being huge, the steak was tender, juicy and cooked to perfection. Although I failed my task of defeating the meat, I thoroughly enjoyed it and would recommend giving it a try if you are up for the challenge! Two main courses down and despite feeling very full we simply couldn’t resist taking a peak at the dessert menu. Immediately our eyes turned to the epic CHOC-tastic Sundae-guilty pleasures aplenty! The indulgent sundae included a delicious warm brownie inside complimented by a light whipped cream, profiteroles topped with crunchy honeycomb pieces. As you can see sharing between two is more than enough and certainly not for the faint-hearted. If you have a Flaming Grill pub in your area and looking for reasonably priced good pub grub with a family friendly atmosphere we recommend you take a trip here! There is something for everyone on the menu; perfect if you are looking for a meal out on a budget with family or friends. Check out vouchercloud’s Flaming Grill vouchers for some money-off, too! Flaming Grill is a firm family favourite, serving up delicious pub menus in their local location across the length and breadth of the country. With our Flaming Grill vouchers, you can enjoy a family-friendly meal out with tasty traditional pub food, drinks, and often events such as pub quizzes and sports throughout the week. Keep a look out for our top Flaming Grill 30% off discount and find your local to relax with few drinks or grab a casual meal out on a budget. How Do I Use My Flaming Grill Pubs Voucher? If you’re up for a bit of fun and want to see how much you can eat in one go, why not have a go at one of the Flaming Grill Challenges? With a steak or a hot challenge to choose from, these dishes are certainly not for the light-hearted or those with a small appetite! If you manage to finish it all, you’ll earn a place for your name and photo on the ‘Wall of Flame’. If you’re unsure what to go for at Flaming Grill, why not try their signature steaks? With the latest taste sensations put together by their team of flavour experts, their flame-grilled beef steaks are seasoned perfectly and served up on a skillet with sizzling vegetables. What's more, the taste is even better when you save with Flaming Grill offers. And, there’s something to suit everybody on the menu, with cheese steak, lamb rump steaks, and surf and turf to name just a few of the options.